Prince William has revisited The Passage Charity – which he first visited in 1993 with his mother, Princess Diana. 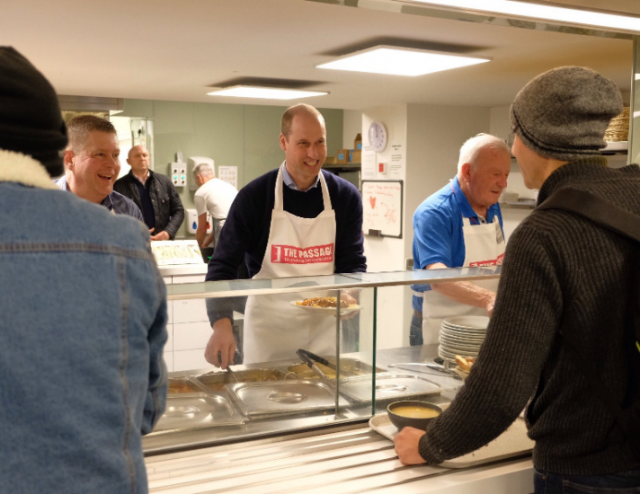 The Duke of Cambridge “has made additional visits at various points over the last twenty-five years”, but visited once again today to help prepare food for the homeless. To mark his visit, Kensington Palace shared a picture of the charity’s visitor book, which shows Prince William and Princess Diana’s signatures from 1993. The palace’s Twitter account also shared videos of The Duke of Cambridge helping serve spaghetti bolognese in the kitchen, for the Passage Charity lunch service. One video showed Prince William working alongside a volunteer named Malcolm, who has supported the charity for the past 21 years. Every day, eight to ten volunteers support Head Chef Nour Shab in the kitchen. There are 450 regular volunteers who work 24 hours a day, 365 days a year – and they collectively helped 2,651 homeless people in 2017/18.